by David Gaunt. 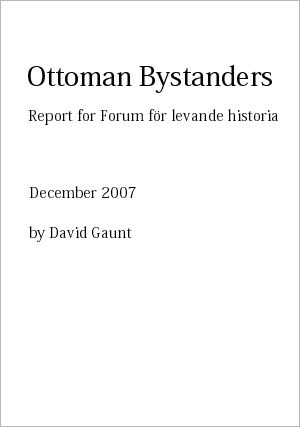 Report for Forum för levande historia, December, 2007. In the evening of August 21, 1915 Joseph Naayem a priest in the city of Urfa (now renamed Sanliurfa) took off his clerical robes and disguised himself as a Bedouin tribesman and prepared his escape from the planned massacre of Christians. An Arab Muslim friend, Sallal had promised to guide him. After passing several soldiers and officials, they found their horses and galloped away. On their way south they encountered one of Sallal’s many brothers, the despotic chief of the tribe, who was on his way to plunder abandoned houses. As they passed words were exchanged and the chief challenged them: “I quite understand! You are busy saving another Christian.” Which was true, as Sallal had indeed helped many others to escape from Urfa. Soon after arrival in Sallal’s village several Turks arrived to investigate the newcomer. Fearing that it might be discovered that Nayeem was a Christian he was taken to hide outside the village until they were gone. When he was able to return he “found everyone in a state of alarm and terror, declaring that Sallal had jeopardized their safety” and they had to ride away.1 Sallah was not the only example of an Arab who protected Christians during the Ottoman genocide. In 2005 the chiefs of twelve Syrian Arab tribes whose forefathers had rescued Armenians were honored at a ceremony in Armenia on the 90th anniversary of the genocide. Despite a number of heroic efforts to protect the persecuted Armenians, Assyrians and Greeks most people remained passive bystanders. Because of the nature of the genocide in the Ottoman Empire there were a great number of ordinary people who knew what was going on. Large caravans of destitute women and children wandered hundreds of miles along roads that passed through the middle of towns and villages. Males were executed at places near to their hometowns. Corpses and pieces of bodies were strewn over the countryside or were floating in lakes and rivers. Survivors huddled in tent camps or at railway stations. It was impossible not to see or understand what was going on and many foreign observers reported about it while it was still in progress. These observers could draw two contradictory conclusions: the first, a minority of observers believed that the Christians were being justly punished for treacherous collaboration with the enemy, or, second the great majority of observers, believed that the Christians were unnecessarily being annihilated to radically erase Turkey’s most inflamed internal political problem, that of minority rights. This study will take up some of the aspects of bystander-ism that are known from the Jewish holocaust, but have yet to be examined for the genocide committed in the Ottoman Empire during World War I. 1 Joseph Naayem, Shall this Nation Die? (New York: Chaldean Rescue 1920).